Hot off the press: OH, I SEE?! Hot off the press and of interest for non-german-speaking comic fans: OH, I SEE?! – Biographical Comics Of LGBTI. OH, I SEE?! is the international, english language sampler of my book ACH, SO IST DAS? !, featuring interviews with LGBTI from all over the world and in all walks of life. ASID won the ICOM Independent Comic Award for an outstanding publication in 2015, and received a special mention as an extraordinary book at the International Festival Of Literature, Berlin, in 2016. The 44 page sampler features stories from the first book, and as yet unpublished stories from ASID #2 (which we’ll release later this year). You can meet me and get the sampler at the Queers & Comics 2017 conference in San Francisco on April 14 & 15, and at TCAF – The Toronto Comic Arts Festival on May 13 & 14. And from next week on, you’ll be able to order it from the Kwimbi Webcomic Shop, if you just can’t make it to SF or Toronto. 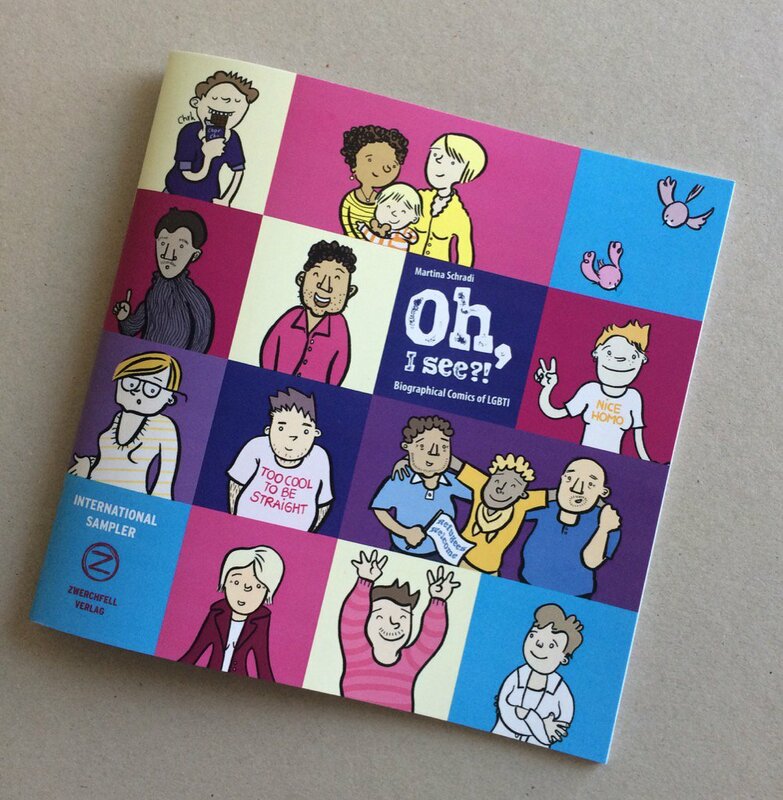 We are so happy to announce an “Oh, I see? !” exhibition at TCAF Toronto Comic Art Festival in May 2017. In partnership with Comicsalon Erlangen and Goethe Institut Toronto, Martina Schradi is invited to attend the festival together with other German artists like Ulli Lust, Anna Haifisch, and others. „Oh I see? !“ in Chinese!! Ever felt that this is a (comic) man’s world? Art Base and its new art curator Emmanouela Charatsi challenge the male dominated comic industry by organizing the first Women’s International Comic Art Festival from 8-11th September 2016.
story-boarders from around the world will give their take on comics’ creation traversing all the way from installations to a simple drawing. MORE DETAILS AND FULL PROGRAM COMING SOON! * LGBTI is an acronym for lesbians, gays, bisexuals, transgenders, trans* and intersex.